Are you using a proxy that eclipse may not be aware of? Niall, thank you for your reply. My eclipse proxy settings are currently at the default values. I’ve reached out to a co-worker who has vast eclipse experience (I’m just starting out) to get his input regarding the probable need to modify my eclipse proxy settings. We are AT&T employees and I suspect a change to the eclipse proxy settings is needed. Thanks again for your reply and pointing me to a possible solution. May be this the source of the problem? I can confirm that we have a temporary problem with our Nexus delivering the archetype catalog. We will fix that on our side and I let you know here once it is done. Should be working again. Thanks for reporting the error! It does work again for me! Thanks Christian! Yes it is working now thanks! It does work for me too!. Thanks!!! i’ve got this problem furthermore. 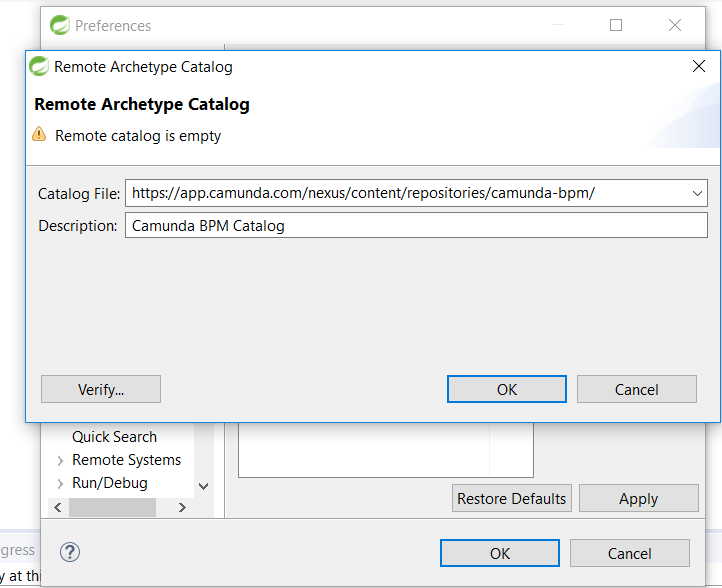 I got this message: “Remote catalog is empty” or “No archetypes available for this catalog”. If I take a local one of camunda bpm archetype dowloaded from github, I got the same message “No archetypes available for this catalog”. I have try it with kepler and neon. It works both with maven. The corporation firewall breaks open the SSL session and dynamically generates a certificate. This works when the corporaten’s root CA is installed in the browser, however often the JVM certificate store is overlooked. i am facing this issue. can someone please look into it? Seems to load up without any problems for me - your problem could be local. I am experiencing re-occurrence of this issue. Can we please check if its the same reason which caused it earlier? It is working for me, please check again on your side. Not sure why it’s not working for me. I have tried connecting from home (outside Corporate firewall), from office. But doesn’t seems to work for me. Please check the screen shot. It there anyway to get the catalog with dependencies download on local and make it work? Same problem for me., When i create a new Maven project --> Camunda Archetype --> Eclipse is showing an error pop up that the remote catalog is empty. but when i open it in a browser, the archetype-catalog.xml is showing up all the jars. I’m a new of BPM Camunda. I try to add Camunda aechetypes to maven, i get a “Remote catalog is empty” error message. Please, Somebody can help me? Thanks for advance.